Close to midnight on a Sunday night is not an ideal time to start any work project. But that's where I found myself two weeks ago as I pulled clothes out of my closet and dresser drawers and placed them into piles on my couch. These were all the possible outfit combinations I could think of, and it took me about 45 minutes until I felt good enough to go to sleep. This was the beginning of my experiment to try planning my outfits for a week. In full transparency, the concept isn't anywhere near new. And it's been widely reported (see: Forbes, Inc., and our very own MyDomaine) that laying out your clothes for the week before can be a productivity boost. Take it a step further and some believe that having a specific daily uniform can even help you make better decisions during the week, as you've already eliminated the "what to wear" one every day (FYI: President Obama practiced this during his time in office). 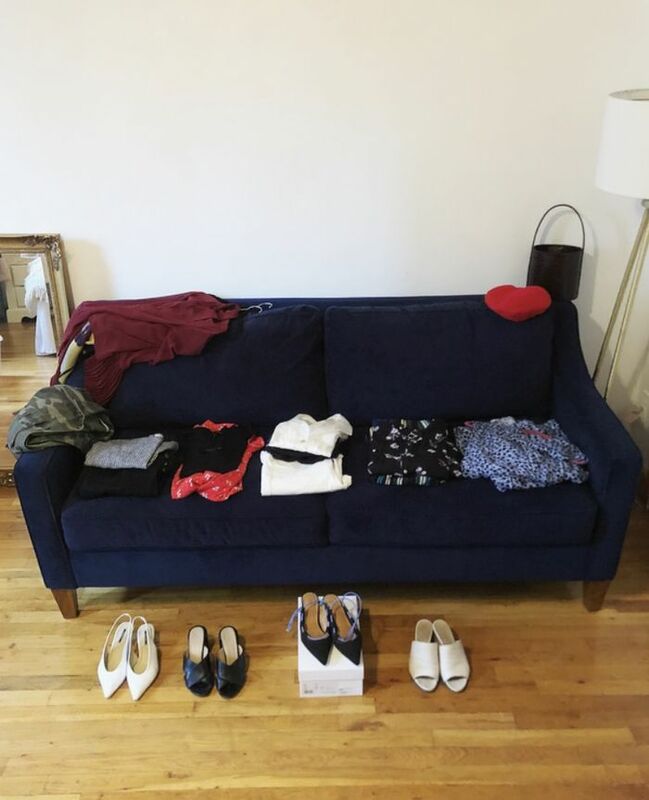 @ginaalilbit; PICTURED: My couch (and bare walls—bear with me, I just moved in) filled with outfit ideas for the week. Admittedly I wasn't prepared to go that far. Actually, I was hesitant to do it at all, which explains why I didn't actually make progress until right before bed on a Sunday night. But for the sake of seeing what my week would be like if I—someone who's never worn a uniform and finds getting dressed to be a very mood-based activity—actually put time aside every weekend to think ahead, I bit the bullet. The long story short is that it was kind of great, but it was not all great. What I missed in getting dressed on the fly I noticed immediately. On the other hand, by the end of the week, I felt quite smug about my speedy morning routine. To get a better sense of the pros and cons, I've laid them out below alongside this week's outfits. @ginaalilbit; PICTURED: Monday was the tamest day of the week. I was mostly in the office, so I took this photo in the ladies' room before heading to catch-up drinks with a friend in the evening. ON ME: Aritzia jacket; Beams top; Levi's Wedgie Ultra Black ($98); Zara shoes; Strathberry MC Mini ($425). Pro: I actually got a complete sense of my week. And I had to—my schedule can be a little all over the place. Workdays can include meetings and previews, evenings there may be cocktail events for work or (hopefully) drinks or dinners with friends, and then there are also 7:30 a.m. workouts (this is not something I like, but you know, health). This week, there was all of the above. I looked at my schedule, knew exactly what to put on that would take me from morning to evening each day, and in the process, it somewhat soothed the Sunday scaries to mentally prepare for a busy week ahead and check off a few items. Con: I wanted options. And ultimately I gave them to myself. Putting together outfits wasn't exactly a challenge, but committing to one was. I wanted to do this test diligently and stick to what I'd laid out for the week. In order to do so, I threw in an extra look when I was planning, telling myself that there's no shame in having an alternate. And there isn't—having options made me feel more comfortable. For someone else, it may feel better to pull pieces from a capsule wardrobe or stick to a specific color palette. I suggest you do what works for you. Pro: I did have extra time in the morning. I was a little overconfident on Monday morning and rolled out of bed later than I should have. I already know what I'm wearing, I justified. But by the end of the week, I was making coffee for myself at home (never happens), sitting down to answer emails in the morning, booking early workouts without fear, and walking to the subway feeling confident for the day ahead. Is this coincidence? Probably not. @ginaalilbit; PICTURED: On Thursday, I had a cocktail event with Net-a-Porter in the evening, so I decided on something I could literally wear all day long. (I live in Brooklyn, so there's not a lot of just stopping home before I go to this thing for me.) ON ME: Staud top; Marni skirt; & Other Stories shoes. Con: I missed spontaneity. Here's the thing: I can find tangible examples of how laying out my clothes for the week helped me be a more productive person. But I also felt kind of predictable. Almost every outfit I laid out on Sunday night was a combination I wore before, and because I never really hung my clothes back in my closet once I figured out outfits (please don't judge me on that one), I saw them the entire week before I actually wore them. In most cases, getting dressed usually feels more spontaneous to me. I'll suddenly reach for a combination of pieces I haven't worn together yet. I'll decide to tie up a top or cuff a pant leg in a different way. The only thing I did, in this case, was to take out a few different jewelry options for the week and allow myself to style those as I saw fit. @ginaalilbit; PICTURED: TGI Summer Friday. I took this photo right after an early morning Flywheel class and before heading to the office for a shortened workday. It was also perfect for meeting up with friends afterward, and comfortable enough to skip the subway and walk instead. ON ME: H&M dress; Adidas Superstar Shoes ($80); Staud Bissett Bag ($375). I woke up the Monday after my test and didn't have an outfit planned. It admittedly took me a bit too long to pick out what was essentially a jeans-and-tee outfit. However, I also decided to wear a top with a kind of kooky fringe detail I haven't worn in months. I think it'd be silly not to be more proactive with my outfit planning going forward, but the way it works best for me is to give myself some slack. If relying on tried-and-true outfit combinations and sacrificing a few minutes on a Sunday are the key to making me more of a morning person, great. I'm willing to do the work. But I also need to wake up and put something on as a reaction to how I'm feeling—excited, serious, and like I want to take on the world. Sometimes that inspiration only strikes when I'm in the moment. Up next: I wouldn't consider myself to be a sneaker person, but these are the pairs I love.